Thanks. Females really are wonderful when you look at them. Love the males in the snow tho. Hugs back! Thanks so much, John, for looking and commenting. What a lovely Cardinal! She’s a beauty! Thanks, Cathe. Hard to resist them, they have such great colors. 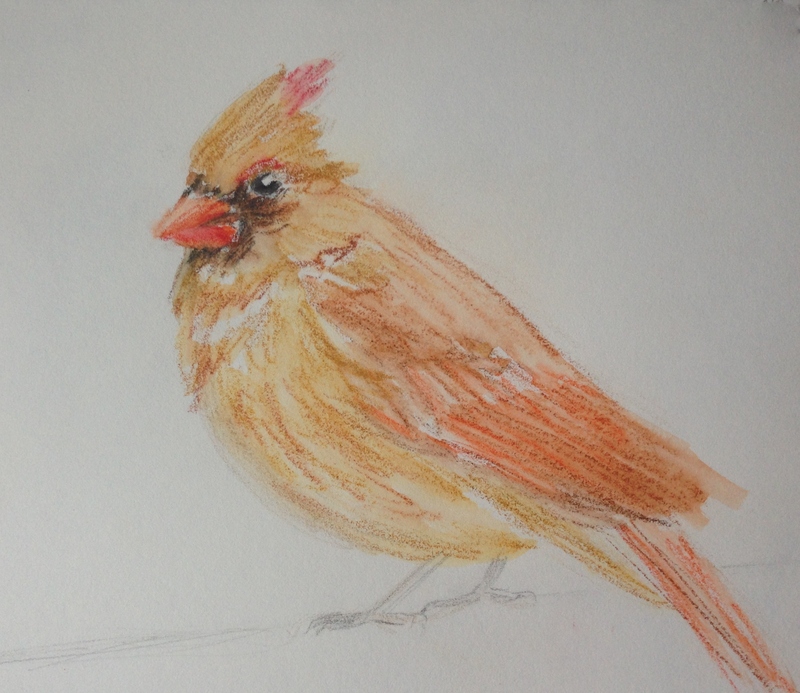 I love cardinals, especially the female, and this drawing is just lovely, captures the bird herself, and also, just looking at the colors in combination – warm and comfortable, somehow.. I agree, Claudia, their colors are just perfect. Really nice combination. Glad you enjoyed it! So right, Jodi, couldn’t agree more. I do love the males in the snow but the females are subtly standouts. Glad you enjoyed! The males are bold and vibrant and their beauty practically shouts, “Look at me!”…but I honestly prefer the layers of loveliness the sweet female displays. Great job! Thanks, Kathy! I’m always glad when you enjoy my artwork of your terrific photos. Thanks, Donna. Really drawn to cardinals lately; seeing so many of them in the snow is really lovely. Thanks, my sweet. You could do this! It’s great Laura! I had so much fun watching the cardinals at the feeder during the recent snow. And doing some quick sketches. I agree – the snow really brings them out. So glad you enjoyed, Eileen. Gorgeous Laura. I wish we had cardinals in the uk, I think they could be my fav? Colors are just tremendous, Rebecca. But your robins are so much more interesting than ours. ❤ Glad you enjoyed this one. Ahh robins are just the cutest, and cheeky! Really nice cardinal! Nice Work! Thanks so much, so glad you enjoyed her! Beautiful cardinal! ❤ We get so many that I've gotten used to them and forget to appreciate how lovely they really are sometimes. I'm going to get the 15-pack Neocolors! It turned out really great. I love it! I love cardinals Laura – this one is a real beauty. Thanks, Mary. I appreciate it!